Bella Cristalli is providing one lucky reader of Daytrippingmom a free Mother’s Bracelet in honor of Mother’s Day. The Bella Cristalli design studio specializes in creating unique mother’s bracelets with the finest materials — including sleek sterling silver beads, Swarovski crystals, and romantic Indonesian Bali beads. For those who are looking for the perfect gift, designs are available in a wide range of exquisite colors and styles that compliment any lifestyle. The pictures above are examples of single-strand and double-strand bracelets. 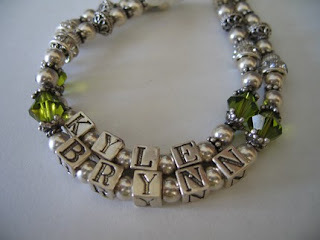 Their Mother’s bracelets are designed for you to showcase your children’s names. Accent your children’s birthdates by choosing birthstones to match their names. To be entered in the giveaway, just leave a comment below here on the blogsite. The winner will be selected Saturday, May 1st. This entry was posted in conttest, Daytrippingmom Giveaway.